I’ve got the best news I’ve heard in a while…. I MADE IT THROUGH WEEK 2!! And I haven’t had one single tortilla chip since I started. Thank you, thank you, please hold the applause. 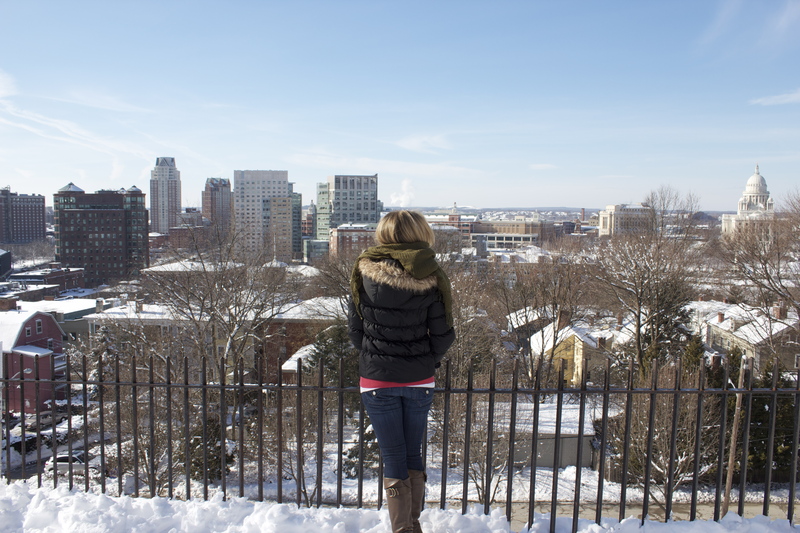 I don’t think I’ve shared yet officially, here I am pre-program in January, looking over my favorite city in New England…Providence! I do have official ‘before’ mug shots but I will be keeping those to myself. 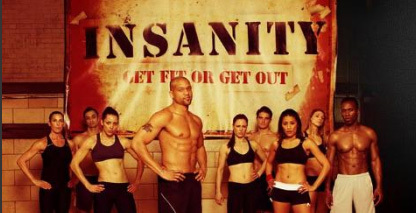 Overall, I’m feeling great and settled right into the Insanity lifestyle. The workouts are still killer but my eating goals have been going great and easier than I thought to manage. Let’s talk about food first. 7:30am: 1 egg/1 egg white omlette w/mushrooms, spinach, avacado. A bit of cheese, 80-100 calorie whole wheat bread, splash of ketchup. 10am: Serving of plain 0% Greek Yogurt with almond butter & strawberries. Some days just a full serving of the yogurt and fruit. Not bad, right? Now that I’m used to this eating plan, I find occasionally only feeling extra hungry about an hour or so after dinner. In this case, I’ll usually have a piece of wheat bread with peanut or almond butter. It’s probably not the best thing to have shortly before bed, but I take the hunger to indicate that I’m a bit low on calories for the day and what always makes me feel super full is any combo of a good fat, protein, and carb. Plus this is usually the only food combo we have on hand that I haven’t already eaten in the day since we’re trying to buy only what we plan to eat each week (no snacky stuff!). However, there will be no cheating allowed with the workout schedule. I have followed my plan to a ‘Shaun-T’ and even added Insane Abs a week early at the end of my Cardio Recovery Friday. I’ve done better ab moves (Jillian Michael’s 6 Week 6 Pack) but I was slightly sore the next day so he really works you because I can usually endure a lot of core. I’d like to write a bit about my concern about the pace/intensity of these workouts. Yes, I love it and overall feel like I’m keeping up better that the average participant in Week 2. However, there are points where I feel like I’m going to die, even sometimes in the warm-up! So during these times, I am certain that my form is compromised. Big time. ST would throw me off the floor if he was here. But I’m a huge believer that if you don’t push through, you won’t improve as fast. An example: Hit the Floors. These ALWAYS get me! I cannot tell you why, maybe it’s the timing in the video, maybe it’s because you jump up and reach up your arms then lunge down, touch the floor, whatever it is they have become my arch nemesis plyo move. Suicides I can do, they’re very similiar (touch the floor side to side) so apprently the combo of touching the floor AND jumping & reaching up just annihiliates me. Anyway, what I’m most likely doing during Hit the Floors is attempting the actual move 4 times or so and doing some sort of modification that probably looks like Suicides for the rest of the time. Is that ok? I guess it will have to be! So if anyone is reading this because they’re considering starting the program, the workouts are a mixture of highs, lows, accomplishments, frustration and a whole lotta hard work. There are times where my body just doesn’t agree with what I want it to do. If you want more detail on each of the workouts this site really breaks it down and helped me prepare for just what I was getting into. 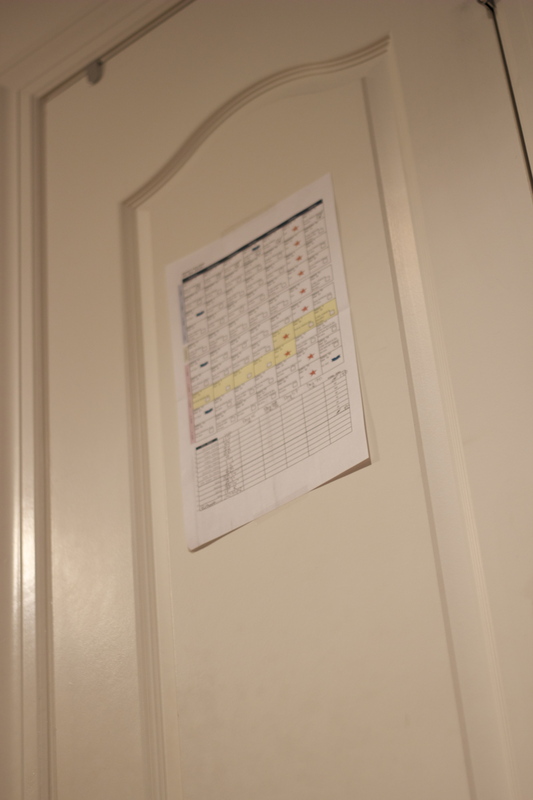 I keep my schedule and results tracked on one big sheet. While I was putting it together, I found the first and last results of Tanya and the other guy who does the Fit Test with ST. Based on that, I estimated where my goal should be by checking out where Tanya was, so I prefilled my Final Goal before I had even taken the test. The good news is that I beat 2 of my final goals in the first round… Switch Kicks and Low Plank Obliques. Had to readjust! I am off to Week 3. Jumping (literally) right back into it with Pure Cardio tomorrow morning! Am I crazy?!? I may be. From what I gather, I’m not the only one. Beachbody workout programs seem to be all the craze. Starting with P90x and most recently with the release of Insanity, apparently the most hard-core of them all. What piqued my interest (along with my boyfriends) was a late night infomercial for P90. First off, let me take a step back and say a little bit more about myself. I’m 26 years old and have been working out for years – 10 I think? Starting in high school with 20 minutes or so every few days running on the treadmill. Eventually I became comfortable with the weight room and dabbled in basic weight training and mat ab work. Fast forward to my college years, and I found myself at all sorts of gym classes. Kickboxing, ab and bum blasters, Pilates and even tai chi. At this point I was doing around half an hour of cardio a day followed by 15-20 mins of weight training, with a couple of days here and there of Pilates. Post college things changed quite a bit. The last thing I wanted to spend money on was a gym membership, so I had to be creative. I moved to Boston in 2007, this is when On-Demand became popular through my cable provider and Exercise TV really turned out to be a god-send (the website is just as amazing http://www.exercisetv.tv). As part of my subscription I was able to view full-length workout videos which helped increase my fitness level and test my body in new ways. In no time I was officially a huge Jillian Michael’s fan, the concept of jump training blew my mind and I quickly became addicted to high intensity workouts. This is also around the time I first gave yoga a shot and learned all sorts of new ways to use my body, I was really inspired by how yoga defined parts of me I had never seen before and how much more dynamic a practice it can be than Pilates. Needless to say, over the past few years I’ve carved out a significant spot in my life for fitness and always find myself looking for the next instructional video to challenge me physically and mentally. I religiously workout every morning, 6 out of 7 days a week. Yes, there have been plateaus, yes there have been times when I haven’t been inspired as much as others, but overall pushing myself physically has become an official and unplanned outlet and destination in my life. I’ve been looking for an excuse to start any sort of blog for the past few weeks, if for nothing more than a creative outlet. At the same time, it seems I always feel an underlying nag to completely re-vamp my life. My diet, my body, my appearance, work, location….I could go on and on. Why don’t other people feel this way? Is everyone so happy or at least satisfied with the status quo that they don’t constantly stretch their mind for ways to improve their life? Anyway, enter Insanity. Am I unreasonably attached to Jillian Michael’s DVDs? Yes. Do I have a Bob Harper DVD that’s still in the wrapper, yet I can’t wait to try it? Yup. Do I think the Beachbody videos are a tad cheasy and cliche? Perhaps. But one thing I’ve learned from self-improvement is to always have an open mind because you never know how things will work out or what will actually make you happy. So I am in! All or nothing baby. I need something to shock my system (both mentally and physically) and since I’ve become strangely addicted to the way it feels to be strong and toned, Insanity felt right up my alley. So I have a confession. You are supposed to complete the Fit Test on Day 1. I cheated a bit (or maybe actually pushed it) and did the Plyo video from P90x. Just to get a taste, and decide which program was right for me. Also, my boyfriend joined the fun just to see what the fuss was about. My impression of P90 was too slow and more geared toward men or those who aren’t used to killing themselves at least a couple times a week. If I was going to make a huge difference I wanted to really feel it, feel like I’m going to die. I decided Insanity sounded like more of fit for me, so I began today with Cardio Power & Resistance. Can I just say that I am not a fan of warm-ups. I usually fast forward to the actual workout if nothing more than to save time. You don’t want to do that with these, the warm-ups are essential and definitely part of the workout if you are looking to maximize calorie burn. All in, the warm-up in this video was close to 15 minutes. The first section was comprised of 3 sets of 8 cardio moves that really fire up your heart rate. Then a brief stretching section. You are literally almost halfway through the workout by the time the warm-up is through. I wasn’t dying as I’ve read in other reviews, but I felt it. The rest of the workout consists of 2 circuits: 3 sets of 4 strength/jump/cardio moves that increase in pace with each round. He also throws in a couple sets in between the circuits so just when you think it’s over, think again. I skipped the cooldown because I was late for work. Cardio Power & Resistance was exactly what I expected. There were certainly points where I wanted to die and I had to modify some moves (especially the Hit the Floor and Moving Push-Ups). Since I’m a Jillian Michaels snob, it did feel like the sequence lacked substance and purpose – just a bunch of crazy cardio moves strung together to make sure the majority of users feel like this is the most ‘insane’ workout they’ve ever done. I always feel with Jillian, the workouts, down to the moves and length of each, are well thought out and purposeful. I’ve put together my own workout and progress calendar which I will share later and do plan on completing the Fit Test on Day 4. Tomorrow is the Plyometric Cardio Circuit, which based on today’s ‘strength’ video will probably be just short of first degree murder. Wish me luck!